Prayer flags (Tib. དར་ལྕོག, dar cho, Wyl. dar lcog) are displayed in the Tibetan Buddhist tradition to generate merit and increase one's life force. Prayer flags are inscribed with auspicious symbols, invocations, prayers, and mantras. Some flags bear protectors and enlightened beings. Sets of five colour flags are displayed in the colours: yellow, green, red, white, blue. These colours represent the elements: earth, water, fire, wind, space. 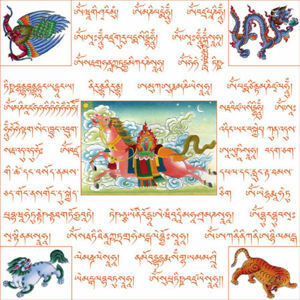 The windhorse prayer flags typically display a tiger, a snow lion, a garuda, and a dragon, (the four dignities) with a windhorse in the centre around which is written the mantra, "May the horse of good fortune run fast and increase the power of life, influence, fortune, wealth, health, and so forth."